Polpette alla Napoletana are Italian meatballs in a simple tomato sauce, and they’re the closest recipe you’ll find to “spaghetti with meatballs” in traditional Italian cuisine. Is Spaghetti and Meatballs Italian? 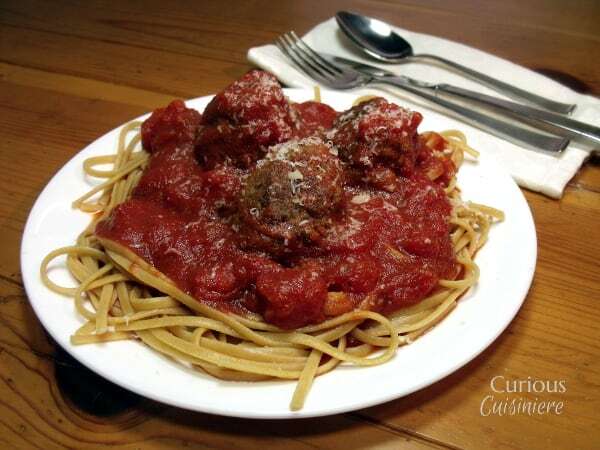 Every Italian restaurant in the States serves up seaming plate upon steaming plate of spaghetti and meatballs. Simply said, when most Americans think about Italian food, spaghetti and meatballs is the first dish that comes to mind. But, much like Fettuccine Alfredo, if you travel to Italy, this is another dish that you are only going to find in restaurants catering to American tourists. In Italy, pasta is typically eaten as a first course, or primo. The primo is typically a non-meat course that is heavier than an appetizer, but not quite as heavy as the next course. After the pasta (or other primo) comes the second course, or secondo. This is your meat (or fish) course, and it may or may not be served with a side dish of vegetables. So, now we see that th emeatballs would come out as a secondo, on their own, and not with the pasta that was served as a primo. 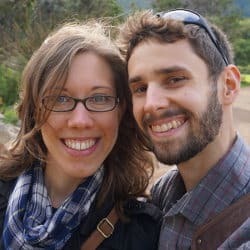 Seriously, doesn’t it feel like we’ve been lied to our whole lives? In a way, I’m sorry to have to crust that magical idea that Italians go around eating spaghetti and meatballs every day. Why Do Americans Think Spaghetti And Meatballs Is Italian? This is the real question. And, no one really seems to know the answer. It could be that poor Italian immigrants started eating meatballs more often because it was an economical way to stretch cheaper ground meat. It could also be that these immigrants started eating pasta as a main meal because as poor immigrants, multi-course meals we a luxury and not a daily occurrence. 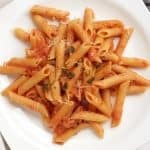 These mothers and grandmothers would have known how to make pasta from scratch, and it would have been an economical way to give their families a taste of home. 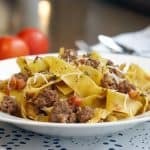 It could also be that as restaurants started opening up to cater to these immigrant communities they found that pasta was an economical item to have on their menu, and combining it with a meat made it more widely appealing as a main dish. Or, it could be a little bit of all of these. For whatever reason, spaghetti with meatballs stuck with the Italian American community and shaped our American impression of Italian cuisine. The good thing is, Italians do eat meatballs. They’re called polpette and are typically either made small enough to use in soup or large enough to act as a main dish. This is where you can get happy again, because, if you’re a meatball lover like us, don’t you just love the idea of diving into one large meatball as a meal? 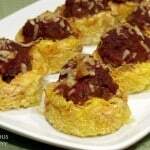 In different regions in Italy, you will find meatballs served with different sauces, broth gravies, and even plain. It is is Naples, in the south of Italy, that it is most common to find meatballs served with a tomato sauce, in a fashion that looks most similar to the “Italian meatballs” that Americans are used to. 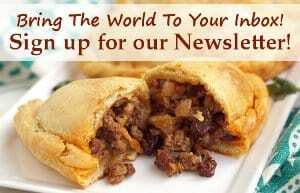 Many cultures around the world have a form of meatballs in their native cuisine. 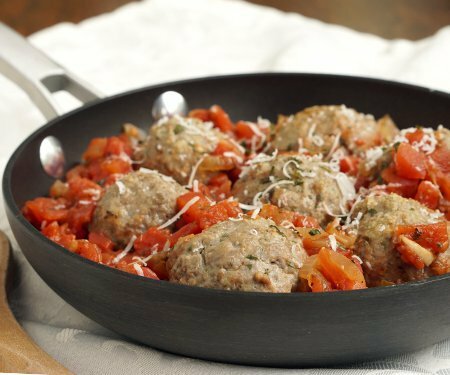 But, there are a few things that make Italian meatballs stand out. First, it is most common for Italian meatballs to be made with stale bread. 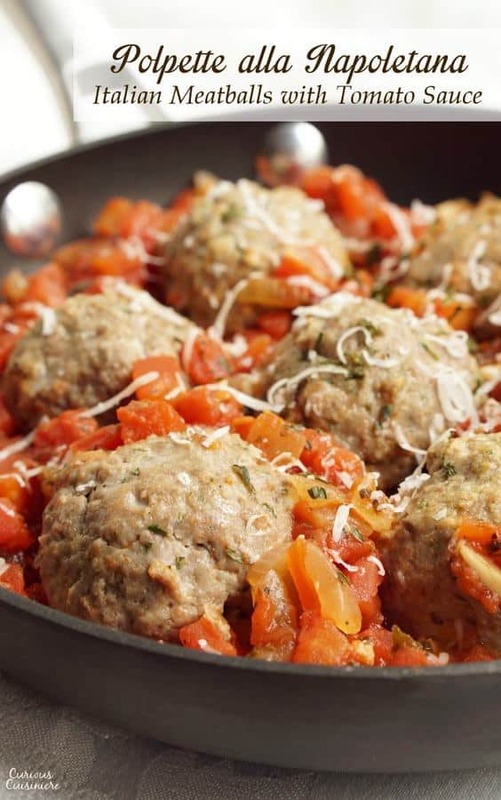 The bread is essential in creating the tender texture of Italian meatballs. The other unique element to Italian meatballs is Parmesan cheese. If you’ve never put Parmesan cheese in meatballs, you need to start now. It’s a game changer! If you can mix ground beef and seasonings, then you can make meatballs. Traditionally, meatballs are either pan fried or broiled. We find that broiling the meatballs gives you a rounder meatball. And it’s quicker because you can cook more at once. 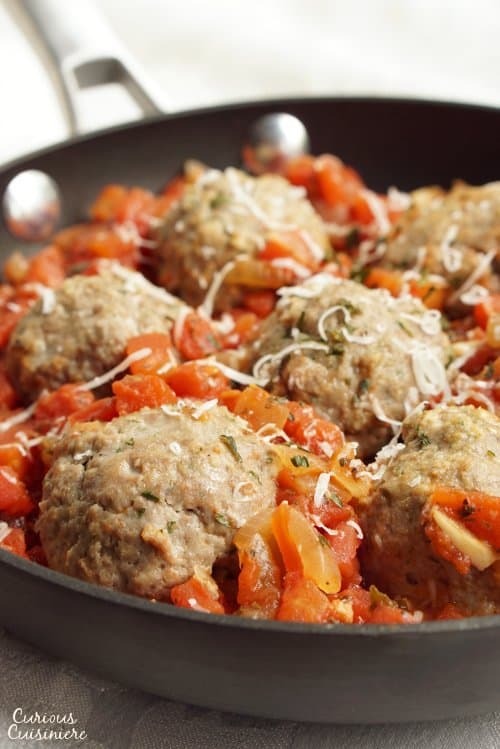 Either way you choose to cook our meatball, after cooking you can use them immediately or freeze them to use later. Whenever we make meatballs, we like to make a big batch. Then, we stash some away in our freezer to be used the next time we get a craving! 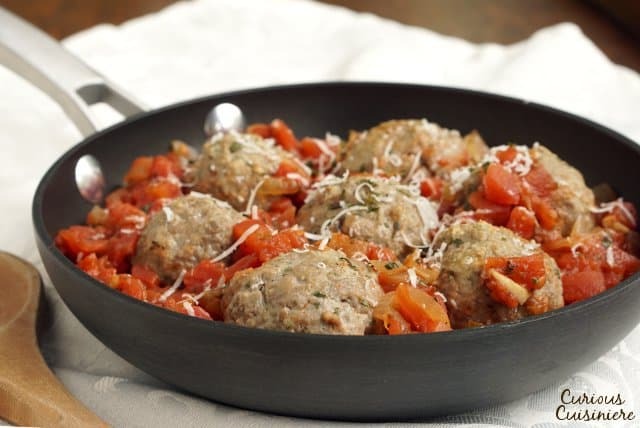 Homemade meatballs are easy to make, and these Italian meatballs are bursting with flavor! Place the bread cubes in a small bowl. Pour the milk over the cubes and let them set for a few minutes, so that the bread absorbs the milk. In a large bowl, combine the meat, eggs, cheese, garlic, parsley, salt,pepper, and soaked bread cubes (along with any milk that hasn't absorbed). Mix, using your hands, until everything is evenly distributed. 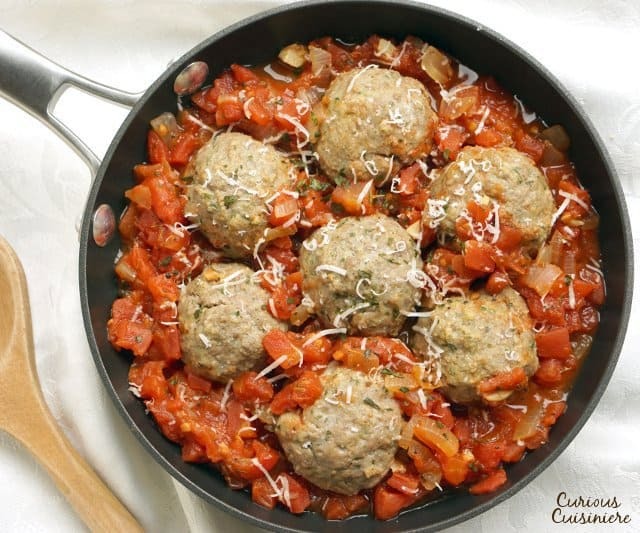 To cook the meatballs, pre-heat your broiler to high. 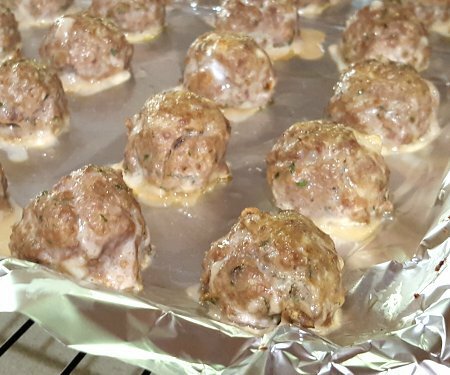 Place the rolled meatballs 1 inch apart on an aluminum foil lined baking sheet. Broil the meatballs for 5-7 min, checking often, until lightly golden. *To freeze the meatballs: Let the meatballs cool after cooking. Freeze them on a baking sheet, in a single layer, until solid. Once solid, they can be transferred to an airtight bag or container to store in the freezer for 2-3 months. 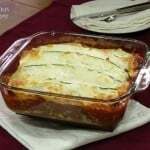 This recipe from 2013 was updated in September 2017. We made the meatballs even more authentic. Enjoy! The closest thing you'll find in traditional Italian cooking to "spaghetti and meatballs", in Naples they serve their meatballs in a simple, tasty tomato sauce. In a large skillet with high sides, heat the olive oil. Add the onions and garlic and saute over medium high heat until the onions are lightly golden, 2-3 minutes. Add the tomatoes and seasonings to the skillet. Bring the mixture to a simmer and reduce the heat to medium low. Simmer for 10 minutes, stirring occasionally. Add the meatballs to the sauce. Simmer, covered for 10 minutes, until the meatballs are heated through. 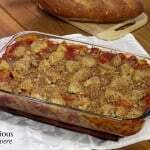 Serve as you desire, with crusty bread to mop up the sauce (Italian-style) or with pasta (American-style). This recipe from 2013 was updated in September 2017. We made the sauce even more authentic. Enjoy! We made these to go with your ziti recipe, and I’ll admit I hadn’t used milk in a meatball before, but I loved the texture it added—much better than breadcrumbs alone. To make them quickly, I created a long log and used a pastry cutter to divide the meat. Then all they needed was a little shaping. Thanks Jeff! So glad you liked them. That’s a great tip for shaping the meatballs. We’ll have to give that a try next time! 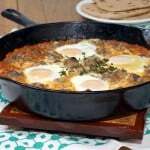 My family loves meatballs & your recipe looks like a winner! I saw it on tasty Tuesday! I can always use a new recipe for meatballs! YUM! Spaghetti and meatballs is a classic combo in this house and I love that you make the meatballs yourself. I have not done that before but I am going to try because these look so amazing. Meatballs rock. I love a good meatball recipe. Nothing more classic than meatballs and spaghetti sauce ! This looks fab !! 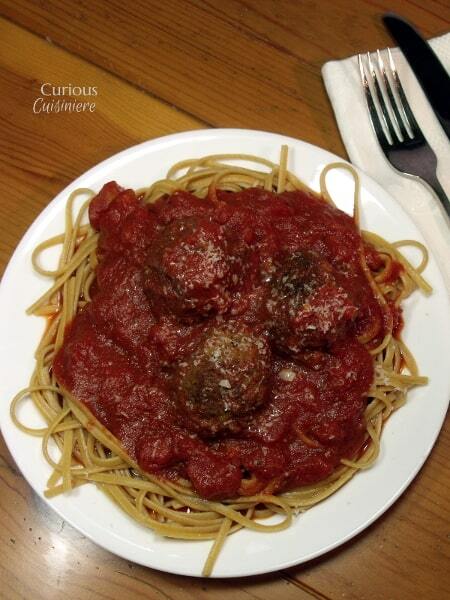 There is always something so fantastic about a yummy plate of meatballs! I just made meatballs this afternoon! 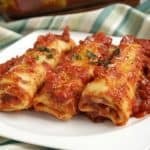 I love homemade ones, and now I’m totally craving sketti + balls! 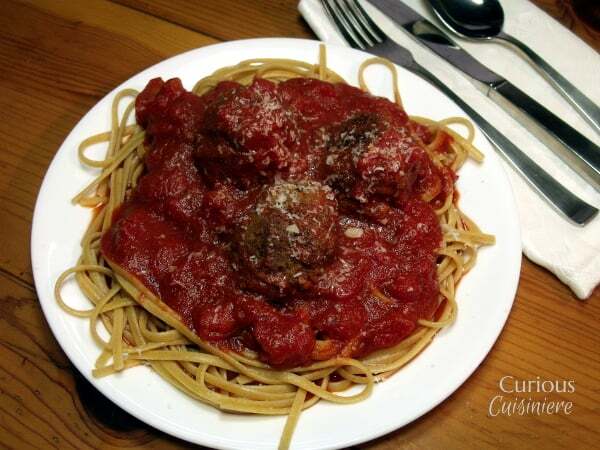 Sometimes there is just nothing better than a big plate of spaghetti and homemade meatballs. Yours looks delish! If we hadn’t had ribs, husband would have totally voted for this as his Father’s Day treat. I’d love a big bowl of those meatballs and your lovely sauce right now! Yum, yum, yum!! Those meatballs look mighty amazing! This is one dish my Husband would love!! !